Stavros tou Ayiasmati, Panayia tou Araka, Timiou Stavrou at Pelendri, Ayios Nicolaos tis Stegis, Panayia Podithou, Panagyia tis Asinou, Ayios Ioannis Lampadistis, Panayia tou Moutoulla, and Archangel Michael at Pedhoulas. The impressive Troodos mountain range stretches across most of the western side of Cyprus, offering cool sanctuary and idyllic hours spent in long walks in its scented pine forests in summer and winter sports and skiing in winter. Famous mountain resorts, Byzantine monasteries and churches perched on mountain peaks, and nestling in its valleys and picturesque mountain villages clinging to terraced hill slopes, make up the splendour of Troodos.The area has been known since ancient times for its mines, and in the Byzantine period it became a great centre of Byzantine art, as churches and monasteries were built in the mountains, away from the threatened coastline. In the Troodos mountain range, besides Machairas to the east, and the actual Troodos district around Mount Olympus (height 1951 metres), there are four other districts, each of which has its own character and separate charm. Pitsillia to the east of Mount Olympus; Solea Valley; Marathasa Valley to the north of Mount Olympus; and Krassochoria, the Wine Villages, to the south (north-west of the Limassol district). These are easy to reach from either Limassol or Nicosia. 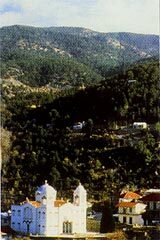 The Pitsilia area lies on the eastern slopes of the Troodos mountains range. Picturesque villages cling to the mountainside amid vineyards, orchards of almond and hazelnut trees, and an astonishing array of wild flowers. 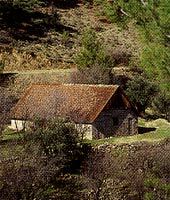 In the middle of the village is the small church of Ayios Mamas built in 1495 with wall paintings signed by Philip Goul. Agros is the centre of the district. It has a good dry climate, gardens of roses, cool springs and hotels for visitors. The Church of the transfiguration of the Saviour (tou Sotiros) is an early 16th century chapel on the hill overlooking the beautiful old villages. Its interior is completely painted with one of the most accomplished series of murals, of the post-Byzantine period in Cyprus. The church of Panayia Chrysopantanassa, built in the 16th century, is the main church of the upper village. It also has four cycles of wall paintings. Stavros tou Ayiasmati, a 15th century church, lying about 3km outside this very pleasant old village, retains the most complete cycles of wall paintings of the second half of the 15th century in Cyprus. This 12th century church stands just outside the village and has some of the finest frescoes of the late Comnenian style (c.1192) prevailing throughout Greece, the Balkans and Russia. Together with Asinou church and that of Ayios Nikolaos tis Stegis, it is considered to be one of the most important Byzantine churches on the island. 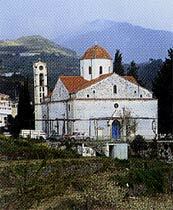 The village's early 16th century church with frescoes of the same period, is dedicated to the Virgin Mary (Panayia). Once the property of Jean de Lusignan, son of the Lusignan King of Cyprus, Hugh IV. There are two interesting churches, the 14th century church of Timiou Stavrou with beautiful wall paintings and the 14th century church of Panayia Katholiki in the middle of the old village which dates to the early 16th century with paintings of the Italo-Byzantine style. The Solea valley is famous for its apples, its Byzantine churches and its picturesque villages. 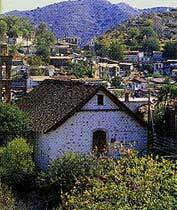 Galata and Kakopetria, villages preserving much of their traditional folk architecture, are popular hill resorts. Both villages are famous for their Byzantine churches. Other important villages in the area are Evrykhou, Flassou, and Korakon. The church of Ayios Nikolaos tis Stegis (St. Nicholas of the Roof) stands about 5km above the village and once belonged to a monastery. It is completely painted with murals dating from the 11th to the 17th century and is considered one of the most interesting Byzantine churches on the island. It gets its name from the steep pitched wooden roof which was built to protect it from climatological conditions. The small 16th century church of Panayia Theotokos, off the main road, retains about half of its murals. The church of Ayios Georghios Perachoritis, to the east of the village, has some very original wall paintings belonging to the first quarter of the 16th century. The old quarter of the village has been declared a protected area and old houses have been restored. There are four painted churches in and around the village. The church of Ayios Sozomenos dates to the early 16th century and retains a complete series of frescoes in the post-Byzantine style. The church of the Archangel Michael or Panayia Theotokos is a timber-roofed chapel just below the village and is completely painted in the post-Byzantine style of the early 16th century. Nearby, is the larger church of Panayia Podithou which once belonged to a monastery. It was erected in 1502 and its paintings are of the Italo-Byzantine style. 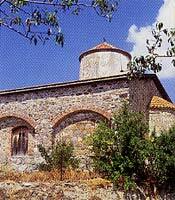 The small church of Ayia Paraskevi on the old Kakopetria-Galata road has paintings of 1514. 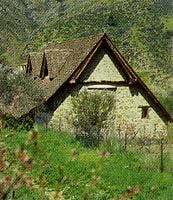 The old inn, the Hani Kallianon, which has been restored is an interesting example of rural architecture. An early 12th century church, dedicated to the Virgin Mary, with frescoes of the 12th century and later periods, considered to be among the finest examples of Byzantine mural painting in the island. This fertile valley, well-known for its cherries on the north side of the Troodos range, offers an alternative route to Troodos, through the lovely mountain villages of Kalopanayiotis, Moutoullas, Pedhoulas, Prodhromos and Kykkos. The village is famous for its sulphur springs and the famous church of Ayios Ioannis Lampadistis with excellent frescoes of the 13th and 15th centuries. 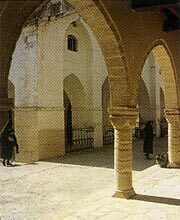 Originally a monastery, it is a complex of several buildings of various dates. One of the biggest religious fairs in the valley is held here on 4 October, St. John's day. 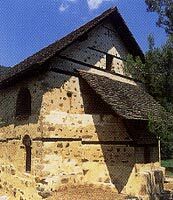 The tiny 13th century chapel of Panayia tou Moutoulla, is one of the earliest examples of the steep-pitched wooden roof type. It has frescoes dating to 1280. The traditional craft of carved wooden basins has been preserved in Moutoullas. Pedhoulas is a summer resort famous for its cherries. The painted church of Archangel Michael stands in the lower part of the village and dates from 1474. The most famous and richest monastery in Cyprus. Founded in 1100 and dedicated to the Virgin Mary, it possesses one of the three surviving icons ascribed to St. Luke. The icon, covered in silver gilt and enclosed in a shrine of tortoiseshell and mother-of-pearl, stands at the front of the iconostasis. The first President of Cyprus, Archbishop Makarios III served as a novice here. At his own wish, he was buried at Throni, 3km west of the Monastery, not far from his native village of Panayia. Religious fairs are held at Kykko on 15 August and 8 September. 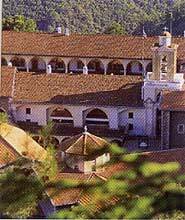 This beautiful monastery standing amid pine trees, was originally founded in the 13th century. The present church, dating from 1731, contains many valuable icons including a priceless silver-plated icon of the Virgin Mary from Asia Minor. A large religious fair is held in the church grounds on 15 August. Deserted monastery near Platres in an idyllic setting, with a nearby waterfall. 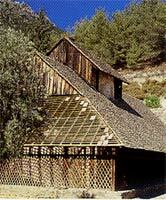 The area, known as the "Krassochoria" (the Wine Villages) is found on the south side of the Troodos range. Old traditions are kept alive in these villages, where the cultivation of the vineyards, and wine-making are still the main occupation of most of the inhabitants. This is the area which produces the famous local dry red wine. Main villages in the area are Omodhos, Arsos, Pachna, Kilani and Vasa. A wine producing village, once the property of Sir John de Brie, Prince of Galilee, with the Monastery of Stavros (Holy Cross), standing by the stone-paved square. 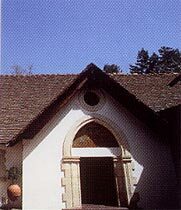 The monastery contains old icons, excellent wood carvings and other ecclesiastical objects of interest, as well as a small National Struggle museum. An old house, with a wine-press known as Linos, has been restored and can also be visited. A wine festival is held in the village every August, and there is a large religious fair on 14 September. Famous for its pottery and its loukoumi sweets. Visitors can see the Pilavakion private pottery collection. An attractive wine-producing village with the single-aisled church of Ayia Mavri, typical of 12th century architecture with murals of the late 15th century. The village also has its own ecclesiastical museum.